The onset of spring has brought the beginning of a very exciting season for both women’s and men’s crew. 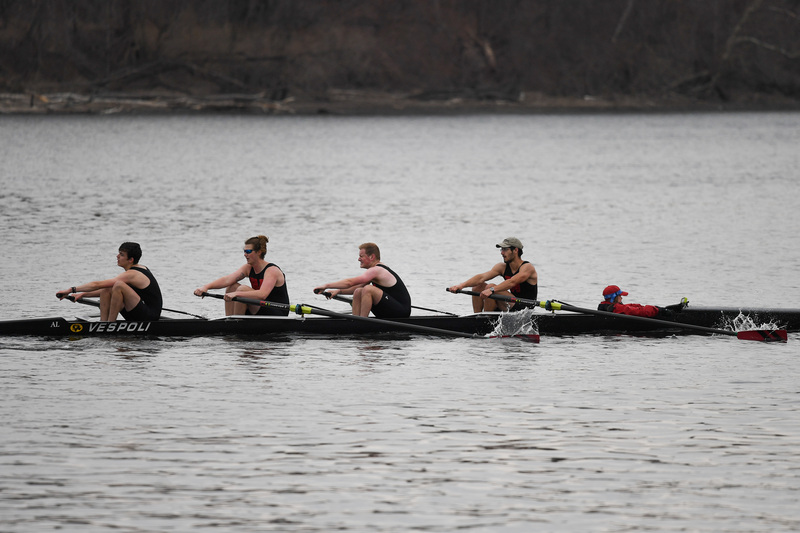 The season opened on March 30 with the teams’ first and only home regatta, where both teams competed in a friendly match against the U.S. Coast Guard Academy on the nearby Connecticut River. There was a slight breeze, but the water was relatively flat with a mild current, boding well for smooth sailing. Indeed, Wes fans were not disappointed; not only was the event thrilling, but the home field also seemed to lend an advantage to both the men’s and women’s teams. Wesleyan wiped the riverbed with the competition’s boats, taking first place in every event. The women’s Varsity 8 crew rowed the 2,000-meter course in 7:02.0, finishing a full 30 seconds before Coast Guard. The women’s second Varsity 8 had a time of 7:21.3, also snatching victory from the Bears by a margin of 25 seconds. These decisive women’s victories were not all the day had to offer. Men’s crew competed in three 2,000m races—two races with boats of eight and one with a boat of four. The Cardinals triumphed over Coast Guard in all three races. The Varsity 8 boat races were a bit more narrow, with only six seconds separating each boat from its competitor, and the Varsity 4 finished the course ten seconds ahead of Coast Guard. 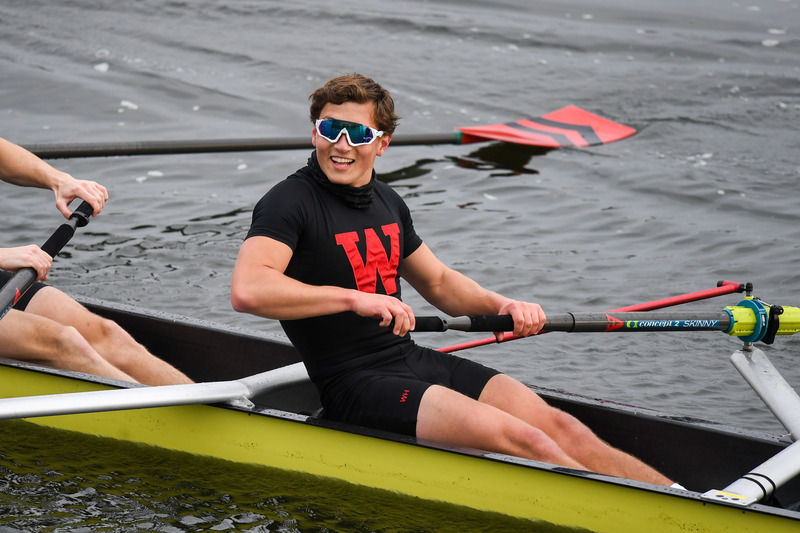 Kai Burton ’21, a rower on the second women’s V8 boat, was glad to see so many Wesleyan students down at the river supporting the teams. 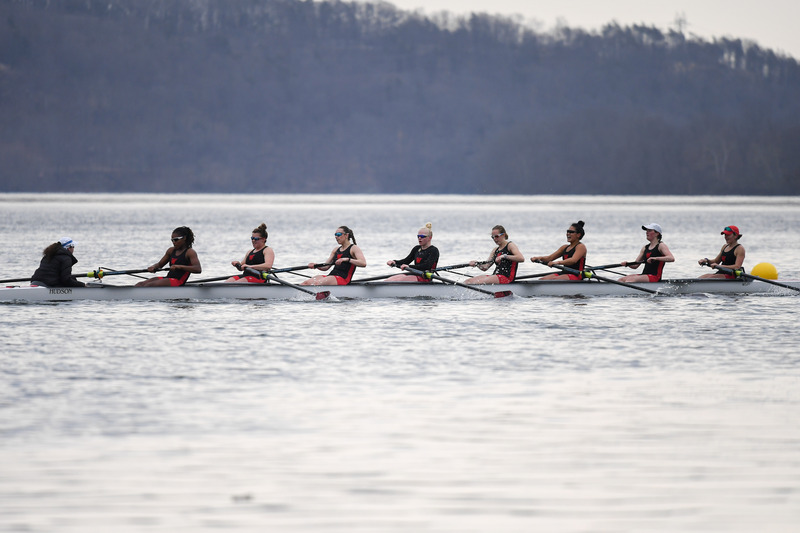 Heading into the second regatta of the season after such an overwhelming victory, the Cardinal crew squads held their heads high on the way to Worcester, Mass. The University of Massachusetts Amherst, Smith College, Worcester Polytechnic Institute, Hamilton, and Colby joined the competitive regatta. The sun was out, and the conditions were lovely. On the water, the men’s team continued to dazzle. Both the Varsity 8 and the second Varsity 8 boats took first place by a staggeringly narrow six and three seconds, respectively. The Varsity 4 couldn’t take the gold but scored silver, as they placed ten second after a WPI boat. These victories were enough to secure the Red and Black first place in the Class of 2003 Cup. As for women’s crew, who participated in the McLaughlin Cup, the fair conditions were not conducive to a win. Their Varsity 8 boat placed in third, a short eight seconds after winner WPI and only two seconds behind runner-up Smith. Their second Varsity 8 took first place, and their third V8 boat was runner-up, close behind Smith. This impressive showing was not enough to win the regatta, but the overall feeling on the water was extremely positive. According to Burton, the crew’s recent middling performance has not left her or her teammates discouraged. They’re confident that they’ve been racing well since the start of the season, and she aims to reach even faster speeds in the future. “Our team is training hard, and at the end of the season, we want to be able to say that we put our best foot forward during the season and raced as hard as we could,” Burton said. Hopefully, Burton and her boatmates will manage to hit their oar-breaking goals soon. We’ll find out this Saturday, April 13, when both teams hit the water in Medford, Mass. to face off against Bates, Tufts, and Wellesley College.